Do you need to replace your roof before installing solar? Once installed, your solar system will operate for decades. If your roofing deck or shingles are halfway or more through their expected service life, it is a good idea to replace them before installing a solar system. Ordinary three-tab asphalt shingles may last only 15 years; dimensional or architectural asphalt shingles warranted for 25 years may last closer to 20 years. Metal roofing is increasingly popular because it lasts for 50 years or more, thus avoiding having to replace a shingled roof two or three times. There are other types of metal roofing (corrugated, CF panel, AP panel, U-panel, R-panel, metal shingles, etc.) available, but attachment bolts must penetrate through the metal roofing which undermines the roofing material. 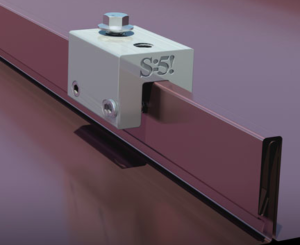 By choosing a standing seam metal roof instead, the solar panels can simply be attached with clips (see image below or installation video), thereby eliminating the chance of leaks, and reducing the amount of solar mounting hardware. previous post: What is the cost/benefit explanation of “high efficiency” solar panels over standard efficiency panels? next post: I hear that with an interest-only home equity loan, the loan payments for solar cost less than my current electric bill. How does that work?